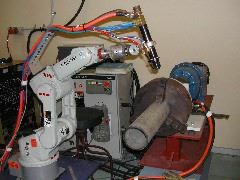 Keyhole TIG welding, developed at CSIRO in Adelaide, Australia, is a method for achieving deep penetration using tungsten inert gas welding. 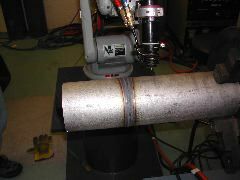 Rather as in laser keyhole welding, the deep penetration allows joints to be filled in using a single pass. 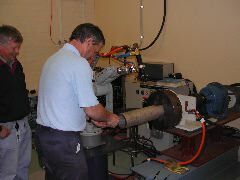 The process has been demonstrated to be capable of making sound joints even in difficult materials such as titanium. 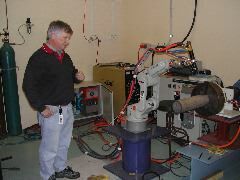 The method works by using a very large welding current (some 1000 Amps). This in itself is not sufficient since large currents can cause a lot of spatter. To avoid this, the arc is allowed to penetrate the lower surface (burn through), but to an extent which allows surface tension to hold the liquid pool in position. The keyhole TIG welding process and Laurie Jarvis, the inventor. The tube is made out of stainless steel. Ken Barton setting up the weld. Just before the commencement of welding. 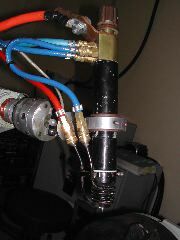 The torch used to convey some 1000 Amps of current during the keyhole TIG process.